I have 40 year old, and tall, azaleas in front yard. Since spring flowering, some of plants (not sure about roots) have turned black and died. The bark facing front is jet black. Is this a rot problem, disease or infection? A few branches, but not many, show white at forks which may be the moss you describe. 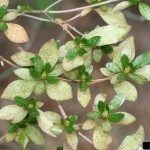 It sounds like you have Azalea Bark Scale, which is a pest and is somewhat treatable. The pests themselves are very hard to spot, especially when the scale problem is coupled with a sooty mold problem, which is commonly found on plants that have bark scale and sounds like what you have. Most pesticides will not work, but we have found neem oil to be very effective against scale and it will also help treat the sooty mold problem.